1. 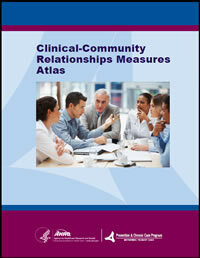 Why Was the Clinical-Community Relationships Measures Atlas Developed? 2. What Is a Clinical-Community Relationship? 3. What Is the Clinical-Community Relationships Measurement Framework? 4. How Do Existing Measures of Clinical-Community Relationships Align with the Measurement Framework? 5. What Are the Existing Measures of Clinical-Community Relationships? The Clinical-Community Relationships Measures (CCRM) Atlas was developed to identify ways to further define, measure, and evaluate programs based on clinical-community relationships for the delivery of clinical preventive services. The CCRM Atlas provides a measurement framework and listing of existing measures of clinical-community relationships, and is intended to support research and evaluation in the field.